For the past few years, Russian authorities have taken steady and strategic steps at the possibility of pushing huge investments in lucrative sectors as ways to strengthen bilateral relations and expand economic cooperation in a number of African countries. That show of corporate investment and business interests has been sealed into various agreements, resulting from high-powered state delegations that frequently visited both regions, Russia and Africa, last year and during the first half of 2015. The vice-president of the Chamber of Commerce and Industry of the Russian Federation, Georgi Petrov, noted at AfroCom's annual executive meeting held in April 2015 that "in view of the current geopolitical situation in the world and the economic situation in Russia, Russian businesses have to look for new markets. In this regard, of particular interest is the African continent, which today is one of the fastest growing regions in the world with an annual GDP growth of 5%. In addition, opportunities for projects in Africa are opened with the accession of South Africa to the BRICS bloc." Brazil, Russia, India and China are members of BRICS. But these Russian trade centers must necessarily embark on a "Doing Business in Africa" campaign to encourage Russian businesses to take advantage of growing trade and investment opportunities, to promote trade fairs and business-to-business matchmaking in key spheres in Africa. Maxim Matusevich, an associate professor and director, Russian and East European Studies Program, at the Seton Hall University, told me in an interview that "in the past decade there was some revival of economic ties between Africa and Russia - mostly limited to arms trade and oil/gas exploration and extraction. 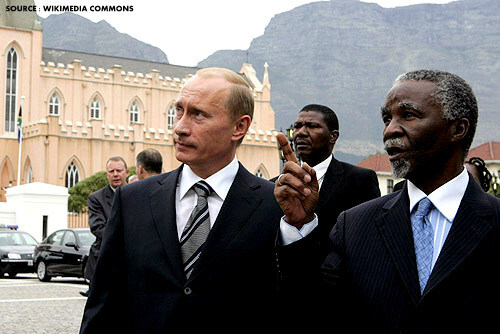 Russia's presence in Africa and within African markets continues to be marginal and I think that Russia has often failed to capitalize on the historical connection between Moscow and those African elites who had been educated in the Soviet Union." And at the start of this year, the high-ranking Russian delegation headed by special presidential representative for the Middle East and Africa, Mikhail Bogdanov, participated in the 24th Ordinary Session of the Assembly of Heads of States and Government of the African Union and on the sidelines held a series of diplomatic discussions with representatives from some African countries in Addis Ababa, Ethiopia. Further, Lavrov held a meeting on the sidelines of the 69th session of the United Nations General Assembly in New York. The meeting was attended on the SADC side by representatives of Zimbabwe (the SADC presiding country), Angola, Zambia, Namibia, Mauritius, Malawi, Mozambique, Seychelles, Tanzania, the Republic of South Africa, as well as the SADC Executive Secretary. Without a doubt, Russia's strategic return to Africa has sparked academic discussions at various levels where academic researchers openly admitted that political consultations are on track, arms export has significantly increased, but other export products are extremely low. Russia's involvement in infrastructure development has also been low for the past decades on the continent. Mhlongo told Buziness Africa that "there is still low Africa-Russia Dialogue or mechanism for dialoguing with Russia, and on the other hand, Russia has not been as aggressive as China in pursuing opportunities in Africa because Russia has natural resources and markets in Eastern Europe, South West Asia. Russian exports to Africa might be dominated by machinery and military equipment which serves their interest well." Mhlongo suspects that Africa still holds an old view about Russia being a communist state and less technologically developed or unsophisticated compared to Western Europe. But Russia never colonized Africa and therefore there are no colonial ties between the two. "If you look at African trade flows to Europe they reflect colonial ties most of the time. However, modern Russia is now one of the important emerging market countries and a member of BRICS. The Russian society is also closed and orientation is towards Western Europe in particular the United States (probably as a result of the period of bi-polar global power system that existed before). Russia exports to Africa but rarely sets up businesses. The language (or culture in general) could be one of the barriers to the development of trade relations with Russia," he pointed out. He further proposed that both Africa and Russia can initiate a dialogue in the form of Africa-Russian business summit to explore economic opportunities between them. However, there are other avenues to engage each other through the BRICS bloc or through bilateral diplomatic channels. Russia has embassies in Africa and African countries have diplomatic representations in Russia. Africa may have to pay special attention to cultural issues and try to understand Russia in this ever-changing environment and find an entry point to engage Russia. "As we witness rapid deterioration of relations between Russia and the West unfold, Russia's decision to ban the import of some agricultural products from countries that have imposed sanctions against Moscow offers great opportunities for the expansion of trade of such products from Africa," the professor observed in her discussion. Experts who have researched Russia's foreign policy in Africa at the Russian Academy of Sciences' Institute for African Studies have reiterated that Russia's exports to Africa can be possible only after the country's industrial based experiences a more qualitative change and introduces tariff preferences for trade with African partners. As a reputable institute during the Soviet era, it has played a considerable part in the development of African studies in the Russian Federation. "The situation in Russian-African foreign trade will change for the better if Russian industry undergoes technological modernization, the state provides Russian businessmen systematic and meaningful support, and small and medium businesses receive wider access to foreign economic cooperation with Africa," according Professor Aleksei Vasiliev, the director of the RAS Institute for African Studies and full member of the Russian Academy of Sciences, and Evgeny Korendyasov, an expert at the RAS Institute for African Studies. Statistics on Africa's trade with foreign countries vary largely. For example, the total U.S. two-way trade in Africa has actually fallen off in recent years to about $60 billion in 2013, far eclipsed by the European Union with over $200 billion and China, whose more than $200 billion is a huge increase from $10 billion in 2000, according to a recent "Africa in Focus " website post by the Brookings Institution. According to the Chamber of Commerce and Industry of the Russian Federation, Russia's trade with Africa, south of the Sahara, is only $3.2 billion. In one of his speeches posted to the official website, Russian Foreign Minister Sergei Lavrov noted frankly in remarks: "it is evident that the significant potential of our economic cooperation is far from being exhausted and much remains to be done so that Russian and African partners know more about each other's capacities and needs. The creation of a mechanism for the provision of public support to business interaction between Russian companies and the African continent is on the agenda." Kester Kenn Klomegah is a research writer and a policy consultant on African affairs in the Russian Federation and Eurasian Union.